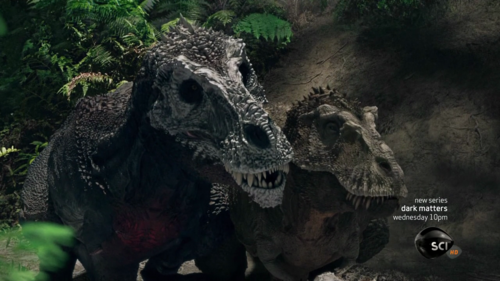 Why do Kron and Bruton (from Dinosaur) look different and are bigger than other Iguanodons in the movie? Since this was probably one of my favourite movies as a child, I always wondered why they were so much larger and different looking than the other Iguanodons? Anyone got any ideas? 6 Responses to Why do Kron and Bruton (from Dinosaur) look different and are bigger than other Iguanodons in the movie? In anatomical terms, Kron and Bruton are older. If you look closely, the male Iguanadon are not only bigger and stockier than the females, but they also have larger nose ridges and spines. They would only grow larger with age. If you look around the Internet, there is concept art of characters that were subsequently cut from the final product, including Aladar's grandparents. Aladar's grandfather had a large nose ridge as well. For skin colour, that's because they played major speaking roles, so they had to be made distinct from all the other Iguanadon. For why Kron and Bruton look different FROM EACH OTHER...see above. Bruton is probably older than Kron, which would explain his superior size of body and nose ridge, but Kron probably was more cut out to be a leader, and Bruton decided to follow his lead. As well, I believe that this website is made by the main artist who worked on the movie. There are also some deleted scenes on Youtube with storyboards.